Long Beach, Calif. – October 13, 2013 – Formula DRIFT presented by GoPro returned to Irwindale Speedway for the final event of the 2013 season. Daigo Saito in the Achilles Tire / Bridges Racing Lexus SC430 takes the event victory. Michael Essa in the GSR Autosport / Yokohama BMW M3 is crowned champion. Lexus wins the inaugural manufacturer’s championship and Hankook Tire wins the tire championship for 2013. Round 7: Final Fight at Irwindale Speedway was held in front of a sellout crowd and was the largest motorsport event in the venue’s history. The exciting event marked the end of the tenth season for the Series and was also the most attended for the Series with approximately over 20,000 attendees over the two day event. The action unfolded beginning with Michael Essa, who entered the event with the point lead, earning the number one qualifying position giving him a good position into the Top 32 and advancing into the Top 16 where he was unable to continue in the event with a blown motor. This opened the door for Chris Forsberg in the NOS Energy / Hankook Nissan 370Z, who entered the event in second place in the standings. 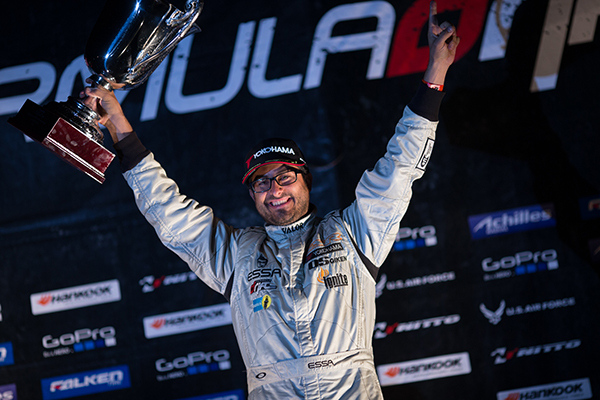 Essa secured the championship when Forsberg lost to the 2012 champion, Daigo Saito, in the Great 8. This marks the first time a European vehicle has won the Formula DRIFT championship. The consolation round saw Robbie Nishida in the Bridges Racing / Achilles Tire Lexus SC300 against Forrest Wang in the Get Nuts Lab / Achilles Nissan 240SX. 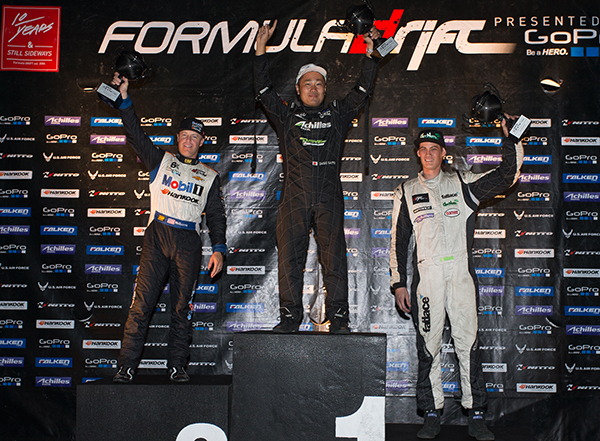 Wang got the best of Nishida to earn third place for his first ever Formula DRIFT podium. The final battle pitted Daigo Saito vs Tyler McQuarrie in the Mobil 1 / GoPro Chevrolet Camaro. McQuarrie hit the wall on the second battle to give Saito the event victory. Two new championships were added to the Series that included the tire and manufacturer championship. After seven events for the season, Lexus comes out on top for the inaugural manufacturer championship, while Hankook Tire takes the first tire championship. Long Beach, Calif. – September 15, 2013 – Formula DRIFT presented by GoPro entered Texas Motor Speedway for the first time. Michael Essa in the GSR Autosport / Yokohama BMW M3 takes the victory and the lead in the Pro Championship points chase heading into the final competition of the 2013 season. Round 6: Showdown saw a return to Texas with the first Formula DRIFT event in the Lone Star State since 2005. Texas Motor Speedway hosted the highly anticipated event under the night sky. The new track proved to be challenging as one of the fastest drift tracks on the circuit and one of the most technical for tandem drifting. The consolation round saw Patrick Mordaunt in the Diamond Lighting / APEXi Lexus SC430 against point leader, Chris Forsberg in the NOS Energy Drink / Hankook Tire Nissan 370Z. Forsberg won the battle to secure third place, but falls to second place overall in the Pro Championship standings with only 15.5 points separating him from the leader. The final battle pitted Essa against Matt Field in the CX Racing / Maxxis / Blacktrax Nissan 240SX. Essa bested Field for his second victory of the season and second straight podium finish to take the event win and lead in the point standings heading into the final competition of the season. 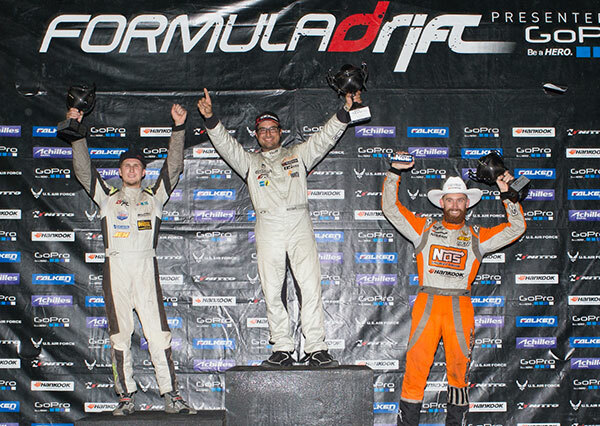 This was Field’s first podium finish of his Formula DRIFT career. Heading into the final competition of the season for Round 7: Final Fight on October 11 – 12, 2013 at Irwindale Speedway. Less than 90 points separate the top six drivers and the championship. Additionally, the inaugural tire and manufacturer championship will be determined at the final competition of the tenth season of Formula DRIFT. Long Beach, Calif. – July 23, 2013 – Tickets for the final event of the tenth season of the Formula DRIFT Championship are on-sale now. Round 7: Title Fight on October 11-12, 2013 will be held at Irwindale Speedway. New all-venue reserved seating introduced. 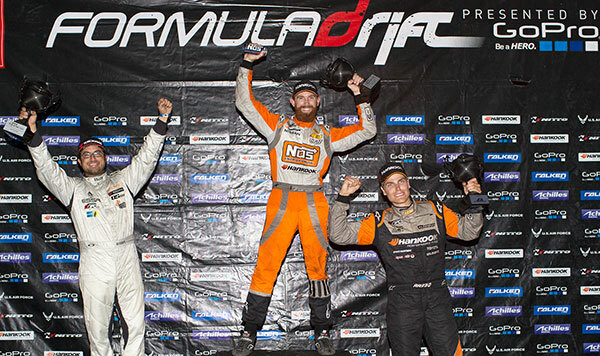 The 2013 Formula DRIFT season will come to a close on October 11-12, 2013 at Irwindale Speedway. For the past three seasons the event has sold out. Early purchase is highly recommended. Tickets are on-sale now and available on www.formulad.com and through HERE. A new all reserved seating arrangement for this venue has been implemented. The two reserved ticket options will include reserved main grandstand seating and the new reserved trackside seating. Additionally, skyboxes are available for the public to purchase. The championship chase is as close as its ever been with less than 35 points separating the top five drivers heading into Round 6: Showdown at Texas Motor Speedway on September 13-14, 2013. The championship will again be determined at the finale. The event will additionally feature the Slammed Society car show, vendor midway, open pits to the public and more. This event also marks the end of the first 10 years for the Formula DRIFT Championship. Long Beach, Calif. – April 10, 2013 – Formula DRIFT has announced a renewal of the highly popular, behind the scenes web show, “Formula DRIFT Insider”. The first episode will kick-off on Thursday April 11th on the eve of the very first live event of the year, Round 1: Streets of Long Beach on April 12-13th. Subsequent episodes will be available every other Thursday on Formula DRIFT’s YouTube page. Formula DRIFT Insider features behind the scenes coverage of the premier drifting brand in the world, Formula DRIFT. “Formula DRIFT Insider is a really fun and cool project for us. We get to not only deliver exclusive content to fans, but we also are able to tell a story between rounds that would not be available otherwise,” says Ryan Sage, Host of Formula DRIFT Insider. The first episode of Formula DRIFT Insider will inform viewers on what is new for the 2013 season and will be available exclusively on Formula DRIFT’s YouTube page at www.youtube.com/formuladrift.